Forgive me for stating the obvious: this is a food blog. But I do have other interests and want to write about them on rare occasions. Well, today will be one of those occasions. I love Jessica Chastain. She is the only reason I sat through 2 hours of The Help. 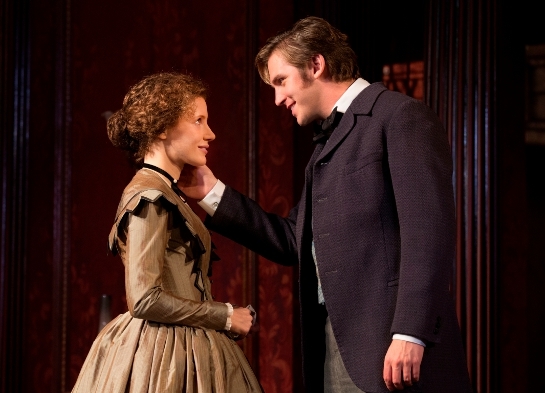 So when I got a chance to see her in The Heiress, a play based on a Henry James novel, I couldn’t pass it up. I’m not a theatre critic; and I will leave the detailed critique of the acting and the set design to them. But I will say that I enjoyed the performance immensely. Instead, I will give you my – hopefully original – take on the play. Let’s imagine Henry James had given a different title to the acclaimed The Heiress. One might imagine he would call it Progressively Backwards. 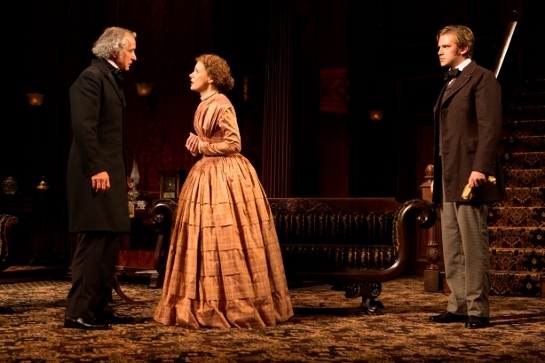 At the core of the play, of course, is the relationship between Dr. Sloper and his daughter, Catherine. But the heart of the play, its soul, rests with the individual beliefs (Dr. Sloper) and transformation (Catherine) of its two primary protagonists. In the end, tradition gives way to progressive pragmatism, with devastating results. Dr. Sloper raises Catherine with the specter of his long-deceased, and beloved wife, always at the trail. The tragedy of his wife’s death, in child-birth, sets the stage for a Sisyphus-like effort – the right schools, the right clothes, the right social connections – for his daughter Catherine to become what she could never be: the re-incarnation of his wife. But underlying this traditional upbringing and desire is a progressive streak that undermines the very apparition he wants to create. Compared to other wealthy patriarchs of his era, Dr. Sloper is quite progressive. Though he may be cold, and sometimes cruel, to his daughter, his concern that she be self-sufficient was rare for the time. He even treats well (and some might argue, treats better than Catherine) his staff, as in Act I, where he chastises the cook for walking on a bad leg. It’s an enlightened view. And though he never plays the role of loving father, his desire that Catherine be self-sufficient, and more germane, clever, suggests a progressive and enlightened streak rarely seen in the day, and perhaps as a means to arm Catherine against a male-dominated society seeking to subjugate women to hearth and home. The irony, of course, is that Dr. Sloper himself was a male-dominator, a subjugator in his own home rather than society at large. And more devastating, of course, is that Catherine became exactly what he wished she would – clever. But, oh, at what cost. By exacting such standards, Dr. Sloper winds up losing the love of the two women he most loved: first, his deceased wife; and second, his only daughter. It’s a stunning price to pay. Catherine, of course, also becomes a victim of her own pragmatism. She wants only the love and affection of her father, a traditional love common to all daughters. And though she tries desperately to be what her father wants, Catherine stumbles along the way. Eloquent and poised behind closed doors, she lacks grace and charm in public, the antithesis to her mother (and to the ever-lasting chagrin of Dr. Sloper). But she is kind and warm, the sort of woman who volunteers her time at the local hospital helping sick children. But through the machinations of her father and Morris, Catherine loses her naivety and simplicity, and becomes what her father wished she would become – clever. But like her father, she also acts cruelly. And like her father, her newfound cleverness (and occasional cruelty) leads to a heartbreaking end. In the end, Catherine has complete control over her own life, both her heart, and more important, her head. Catherine has become, wittingly, a “progressive” woman. She is her own woman, without the need for men, comfortable in the companionship of Aunt Penniman. She has found her own self-worth. She is liberated. But at what cost. The victory of self-worth doesn’t come without casualties. As Mrs. Penniman laments at the end of Act 2, growing old in loneliness is no way to live. 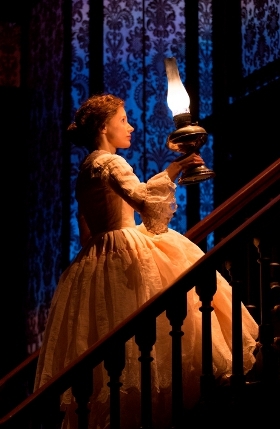 And at the end, as Catherine ascends the staircase alone, a smile on her face with the yelps of Morris at the door, we are left to wonder: is it all worth it?